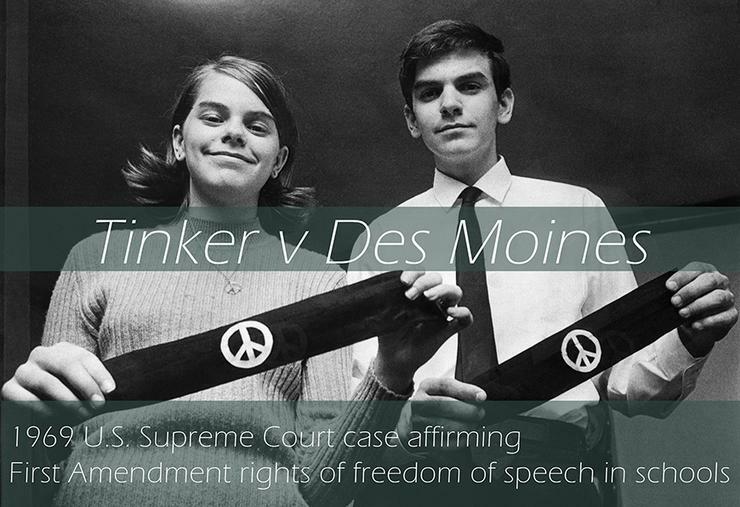 Wednesday, February 20, 2019 from 5:30 p.m. to 7:30 p.m.
USD School of Law is holding a reception and panel discussion in honor of Tinker v Des Moines - a 1969 landmark U.S. Supreme Court decision that established students’ First Amendment free-speech rights in public schools. The case began in 1965, when some Iowa public school students wore black armbands to school in silent protest against the Vietnam War. After being suspended by their principal, the students sued. When their case reached the Supreme Court four years later, the justices decided by a 7-2 majority that the First Amendment did apply to public school students. "It can hardly be argued," Justice Abe Fortas wrote in the majority opinion, "that either students or teachers shed their constitutional rights to freedom of speech or expression at the schoolhouse gate." This event is open to the public, USD faculty/administrators, and all undergraduate, graduate, and law students. USD School of Law is a State Bar of California-approved provider of MCLE credit and certifies that this activity is approved for 1 hour of general credit. The Jane Ellen Bergman Memorial Lecture Series on Women, Children and Human Rights is the result of a from Dr. Barbara Yates, a longtime professor at the University of Illinois and a friend of the late Bergman. According to Dr. Yates, Bergman was “an ordinary citizen who chose to devote her professional life to public service. As a nursing administrator, public health educator, and family therapist, she developed an abiding interest in the human rights of common people, especially the plight of women and children, in a rapidly changing world.” This series is a lasting tribute to Bergman and an opportunity for USD students, faculty and staff, as well as interested members of the community, to hear distinguished lecturers speak about issues concerning women, children and human rights. USD School of Law's Children’s Advocacy Institute (CAI) is California’s premiere academic, research, and advocacy organization seeking to improve the lives of children and youth, with special emphasis on improving the child protection and foster care systems and enhancing resources that are available to youth aging out of foster care. CAI seeks to leverage change for children and youth through impact litigation, regulatory and legislative advocacy, and public education.